Upgrade Your Phone: Samsung Galaxy S III Or LG Nexus 4? Just recently, Google gave all of us the long expected news: a new Nexus phone in partnership with LG packing the new Android 4.2 after having to postpone the launch event with one day due to weather conditions. The question that arises now is, which one is better, Samsung Galaxy S3 or Nexus 4? Maybe you want to buy a new phone and you cannot decide which one is better. Or maybe you want to buy a second phone and you’re already packing the S3. As an owner of a Nexus device, I can tell you that it hasn’t let me down until now, and Nexus devices are always the first that get the latest Android firmware updates, and that’s definitely cool. 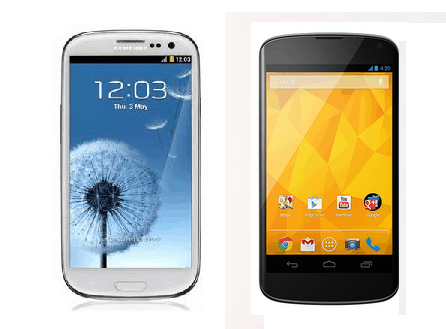 We’ve prepared a short comparison between the Nexus 4 and Galaxy S III, and it’s up to you to decide which phone fits your needs best. First of all, we’ll start with dimensions: The Galaxy S3 is thinner than the Nexus 4 having 8.6 mm vs 9.1 mm. Galaxy S3 is also bigger at 71×137 mm vs 69×134 mm. The S3 is also lighter with 133g vs 139g. Are these differences enough to make a decision between the two phones? I don’t think so. So far the two devices keep up with each other very well. Which screen is better? Comparing their sizes, we cannot notice a big difference. Galaxy S3 packs a 4.8 inch screen and the Nexus 4 a 4.7 inch screen. The technologies though differ. Samsung has a Super AMOLED and LG has WXGA IPS display scoring more in screen resolution with 768×1280 pixels vs the Galaxy S3’s 720×1280 resolution. A bigger resolution means more ppi also. So Nexus 4 has 320 ppi and Galaxy S3 only has 306 ppi. This makes the Nexus 4 screen better than Galaxy S3’s screen. Which processor is better? The battle is strong here as both devices come with top-class technology. More precisely, the Galaxy S3 has a 1.4 GHz quad-core Exynos CPU, more than enough some might say. Meanwhile, the Nexus 4 also packs some real heat, having a 1.5GHz quad-core Snapdragon S4 Pro CPU. You make the math, and see that Nexus 4 beats Samsung’s Galaxy S3 this time, having a better processor. RAM memory:There’s a slight issue here as the international Galaxy S3 has 1 GB RAM and the US Galaxy S3 has 2 GB. But even so, Nexus 4 also has 2 GB RAM memory, and it seems it wins again. So Nexus 4 has more RAM memory than Galaxy S3, we can say. When it comes to internal memory, the Nexus family never actually scored very high. LG’s Nexus only comes in 2 versions, an 8GB and a 16GB version with no SD card slot. The Galaxy S3 comes in 3 versions: 16GB,32GB and 64 GB and also allows SD cards up to 62 GB. The winner at internal memory is Samsung for sure. Which Camera is better? Rear camera is the same for both devices: 8MP, LED flash and 1080p recording. The front facing camera though is better on the Galaxy S3 than on the Nexus 4. We’re talking about 1.9 MP vs 1.3 MP. The Nexus 4 does come with the advantage of using the latest Android and its latest camera software. So we can make that a plus. Other comparisons on hardware: Galaxy S3 has LTE, Nexus 4 doesn’t have LTE. That can be considered a big disadvantage in countries where LTE technology is available. Both phones have NFC, a 2100 mAh battery and notification LED. Regarding the Operating system, it’s by far the easiest call to make. Nexus 4 comes with latest Android OS, 4.2 called also Jelly Bean, while Samsung Galaxy S3 is still in the process of updating from Android 4.0 to Android 4.1. Also the Nexus 4, being a Google device, will most probably get the latest updates first. If you want to decide which device to buy, and you’re on a limited budget, the decision couldn’t be any simpler. For only 299$ you get a top-class device with the latest software on the market and one of the best hardware, unlocked and with no contract. That’s the Nexus 4 I’m talking about. On the other hand, Galaxy S3 costs 600$ unlocked, and around 200$ more or less for a 2 year contract with a carrier. If you want to get yourself a cheap smartphone but also top class, almost the best out there, get yourself a Nexus 4. Conclusion: For me, the conclusion is more than clear. The LG Nexus 4 not only comes with the latest Android, amazing CPU power, clear Screen resolution but also has an amazingly low price compared to the one of the Galaxy S3. I would recommend buying a Nexus 4 any time of the day, and probably I will also.